One of our main goals goal is to reach out to others through professional music video productions and concerts. We will aim to film around 5 songs during the two weeks, and conduct two concerts in local churches. The videos may be watched by thousands of people, around the world on YouTube, Satellite TV and free-to-air stations. Music Camp caters for a very broad age range of 12 - 30yrs. Participants under the age of 18 will be under the full supervision of assigned youth leaders (18+). Attendees will be divided into units or teams of 7-9 participants + youth leaders. The daily schedule starts at around 6am with morning devotions, showers and unit sharing. This is followed by a hearty breakfast, lodging cleanup, an exercise routine and Deep Bible Study. The rest of the day is devoted to music rehearsals, workshops and voice/instrumental recordings during the first week, and filming production during the second week. The evenings can be spent practicing parts, in sectionals, and participating in some of the organised evening activities. During campfire time, all of camp unites together in song and in contemplation of God's love through singing and a devotional message. If I am under 12 or over 30, can I still come? We sometimes make exceptions, please contact us. Camp food is delicious! 100% plant-based. A main breakfast, lunch and light tea is provided each day. Do we have to stay in tents? No, not at this stage :). The current venue provides dormitory-style accommodation. If your parents are at camp as staff or guests, you will be roomed together with your parents. Otherwise, you will stay with your unit in a dormitory room. Electronic devices are one of those things we limit so we can have a 'distraction-free' environment to focus on the musical training and on connecting with God. Mobile phones are allowed for participants 18+. Camp is in the middle of winter! Be sure to bring plenty of clothes to stay warm. Skimpy / revealing clothes, sleeveless tops, low necklines, and short garments (above the knee) aren't allowed in the dress code. To have the most enjoyable camp experience, be sure to wear skirts or dresses (for girls) and long-pants or shorts (for boys) that reach below the knee. See the camp handbook for more info. I don't play any instruments! That's fine! Willingness to sing in the choir is the main pre-requisite. 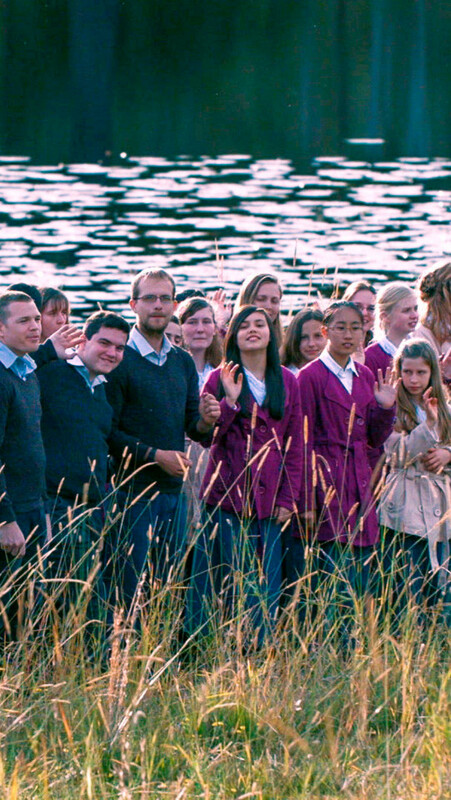 You can be in involved in every song, as part of the choir. We're always open to something a little different. Let us know what you have and we'll see if it fits! Some things like drums, or electric guitars don't really work in this genre.